This year my partner and I have started gardening. There’s a wealth of research out there into the physical and mental benefits of gardening. We’ve really enjoyed getting out into the fresh air, get our bodies moving, and have time to nurture the space. We moved last year to a new house that offers us space to both work from home. With our new house came a big garden, perfect for our little two to run around in and cause havoc! What became clear pretty quickly was that with a big garden comes much gardening… And so after a slow start, this year we started our gardening journey. Little by little, we’re spending more time in the garden, taming the weeds, planting some new varieties, and tending to the more established ones. We even grew tomatoes for the first time, and recently harvested them to our great delight; they were delicious! When I was younger, gardening always seemed like something that ‘old people’ did. I’m now one of those old people and I’m really benefitting from the mindful moments spent nurturing our outdoor space. The benefits of gardening are plenty. Getting out in the garden keeps you physically active, but it also allows you some time to reflect and connect with nature. 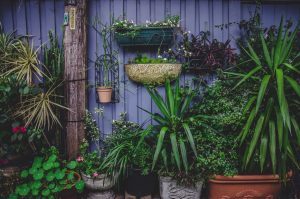 Gardening gives you a chance to step away from the over-stimulating world of technology that we live in and slow things down. There have been studies into the benefits of gardening for reducing anxiety and depression. One of the most common pieces of advice I give my reflexology and massage clients is to get outdoors, even for five minutes a day, with no distractions, phone off, and have a mindful moment. It really makes a huge difference and is easy to incorporate even into the busiest of lives.